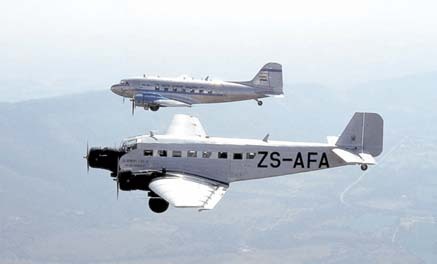 "Classic Flying and Big Game Safaris in Africa"
The time of telegraph lines and hand-crank telephones; of mail ships, steam trains, propeller-driven airliners. The time when traveling was an adventure, and the day's journey stopped for the night at elegant hotels with spacious lobbies, rattan chairs, and crystal chandeliers, with service on a silver tray and white gloves… At African Aero Safari we operate our Classic Flying and Big Game Safaris in a style recalling that vanishing past of explorers, traders, and drumming from the wilderness. Hike through woodlands on foot with an experienced ranger. Explore narrow waterways in pole-driven dugout canoes and glide through lily ponds past hippo pools. Birding enthusiasts will tick off new sightings among the 800 species of birds resident in southern Africa. You'll drive through plains of tall grass and golden savannas and stark desert wastelands; you'll pause to take in the glorious view at the top of a spectacular mountain escarpment; rejuvenate yourself in the power of pounding coastal surf, and bask in the sunshine of a warm tropical lagoon. You'll meet and talk with native people, walk through their dwellings in modern African townships; taste the food, hear and feel the rhythm, music and dance of modern African cities and townships with vibrant food and craft markets; you'll learn about cultural traditions born centuries ago that survive to this day. You'll visit reconstructed rural villages, see ancient cave-dweller rock paintings, explore caves where archeological diggings produce evidence of earliest man; climb the Great Zimbabwe Ruins, reflect on history at ancient battle fields, and visit colonial buildings that outlasted the colonial powers themselves. Fly low over Victoria Falls and past a sea of sand dunes of the Namibian desert; witness the spring wildflower spectacular of the South Africa's Namaqualand hills; hike along coastal trails, through desert canyons; watch hippos splashing in the shallows of the great Zambezi River from the deck of a riverboat. Sporting sojourns…bungee jumping from Victoria Falls Bridge, white water rafting in the Zambezi gorge, scuba dive reefs on the Indian Ocean coast; sky diving, paragliding, championship golf courses; mountain angling and deep-sea fishing. Each Classic Flying Safari is complete yet you'll want to return again and again. The definitive "Out of Africa" experience is staged across the vastness of Namibia, Botswana, Zimbabwe, Mozambique, and South Africa. New exotic destinations are constantly considered. Your primary mode of transport is a classic airliner. But you'll move between some destinations in other classic conveyances, too. 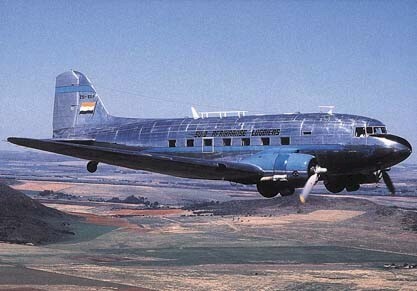 The Douglas DC-3 is the airliner that pioneered air travel on so many continents. The aircraft we use -- immaculately restored and maintained by several private charter companies - are outfitted for groups no larger than 21 passengers. The Gulfstream G1 is a pressurised, turboprop airplane - luxuriously outfitted for no more than 18 people. We use this classic for the longer haul journeys, ensuring speed and comfort en route. The Beechcraft-18 is another grand-old veteran of the airways. This aircraft, more suitable for smaller groups (up to eight passengers), can fly into shorter airstrips thus allowing flights to a greater number of bush lodge destinations. The Beechcraft Staggerwing is another unusual safari vehicle and suitable for two passengers or a maximum of three only. The Staggerwing Safari is ideal for a honeymoon or anniversary. This classic aircraft, considered a Deco masterpiece, was first constructed in the 1930's. 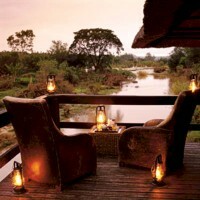 A 10-day safari with stops at the most exclusive bush lodges and southern African hotels is unparalleled in the world. These aircraft enjoyed their heyday in the 60's or earlier. They have been immaculately restored and are maintained to the highest standards. You will relax in their spacious, comfortable cabins, taking in the magical vista of Africa passing below. For maximum comfort, flying is usually restricted to mornings or late afternoons to minimize air turbulence. Most flight legs are from one to three hours duration. Itineraries may combine comfortable journeys in restored railroad trains with luxury accommodations in restored railway wagons - some powered by steam locomotives. You'll travel across the African savanna or over breathtaking mountain escarpments pampered in five-star luxury. Wild Coast & Garden Route - spectacular shoreline. Mozambique - tropical island hideaways, big game fishing, underwater world, pristine beaches. Each tour is an experience of people, exotic cultures, customs, and extraordinary vistas. Knowledgeable guides accompany each tour and maximize insight and perspective you'll take home with you. You will come away having felt the heartbeat and power of Africa -- primal and modern, legend and legacy, myth and medicine. 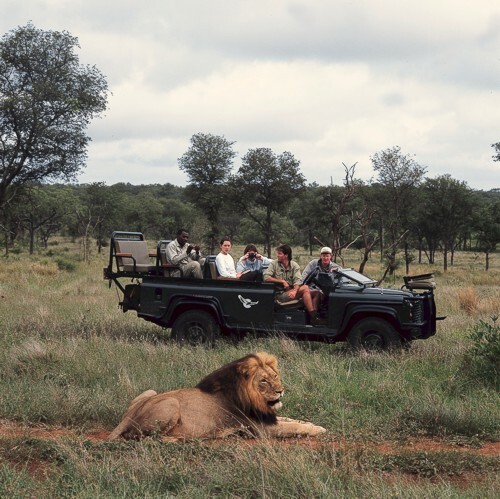 Right from the start, this self-fly safari is big on wildlife. 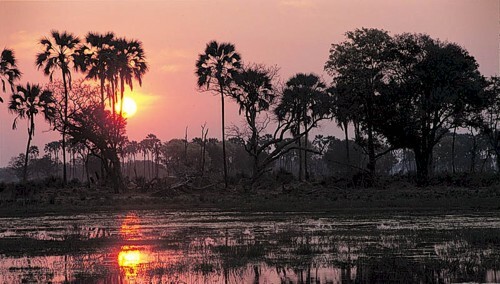 11 focused days showcasing Southern Africa’s diverse ecological regions and their prolific natural wildlife; sand veldt, bush and savannah, prehistoric lakes and pans, the Zambezi River, Victoria Falls and the Chobe floodplain. We visit many game parks and the Okavango Delta in our quest of discovery of all the creatures, large and small, local tribes, their cultures and traditions. We visit three sovereign countries, overflying two more. Legs are comfortably short with only one close to three hours; whilst the inland plateau is generally flat, the magnificent Drakensberg massif, lakes and forests lend a different slant to the Africa you envisage. Relive a century past and follow in the footsteps of the great explorer, David Livingstone. We start in Nairobi, Kenya. Here we are introduced to the grand style of the 1930's - the country clubs, the rolling hills, the gin-and-tonic colonial lifestyle. We meet our personal aircrew for the days ahead, and boarding our private, pressurised airplane, we fly down to the Masai Mara for 3 days. Continuing past Africa's highest peak, Uhuru (which means "freedom") that tops Kilimanjaro, to the Tanzanian Ngorogoro Crater and the Serengeti Plains for a further 2 nights. Then we move on south to Mfuwe, gateway to the South Luanda National park in Zambia. We spend a night here tracking leopard, then on to Victoria Falls for this magnificent gem of history and one of the 7 wonders of the world. Two nights on the mighty Zambezi river and on into the Okavango Delta, Botswana, home to Africa's last truly free roaming plains and water game combined in one great area. 3 days here feels too little and we move south to the Tip of Africa, landing in Cape Town - South Africa, for a grand finale to our unique tour. Winelands, Table Mountain, the Peninsula, the grace and fine living that can only be experienced in this corner of the world. Limited departures during the year; small groups only - please call or email us for dates.